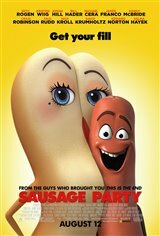 A sausage named Frank (Seth Rogen) leads a group of supermarket products, including his hotdog bun girlfriend (Kristen Wiig) and fellow sausages Barry (Michael Cera) and Carl (Jonah Hill), to the promised land: home with a human. However, they soon discover that all is not right in the world outside of the grocery store. Rather than co-existing in harmony with humans, they're being slaughtered and eaten by them! Now Frank and his friends must warn their edible comrades of these unspoken injustices and fight against the eventual genocide of foodkind as they know it.